The Sofa Collection includes a wide range of aniline leather sofas and armchairs. Upholstery options include a selection of full aniline leather, semi aniline leather, corrected grain leather and rub off leather. Please see our online swatch which shows the leather options available. 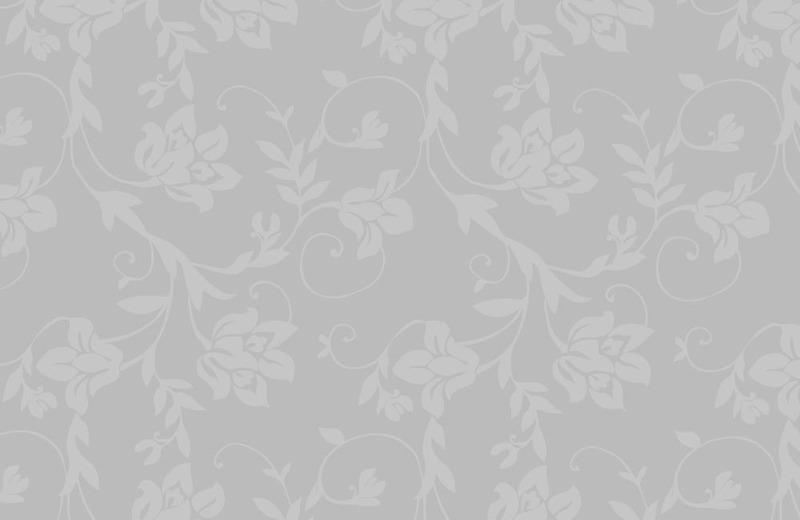 The Sofa Collection can be viewed in Flash by clicking here, alternatively Vintage Leather Sofas can be viewed in HTML on this page, Premium Leather Sofas can be viewed here, and the contemporary fabric sofas can be viewed in HTML by clicking here. 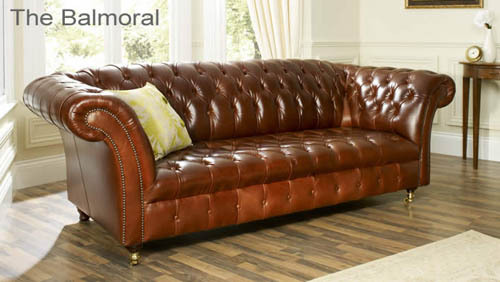 The Balmoral is based on the classic Victorian Chesterfield but with a modern twist. This settee looks stunning in full aniline hand dyed leather. It has a fully sprung seat and back which is deep buttoned offering an incredibly comfortable sit. It has exposed hardwood legs with solid brass castors. 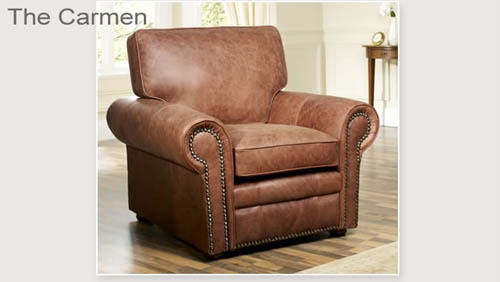 This model boasts both comfort and elegance. 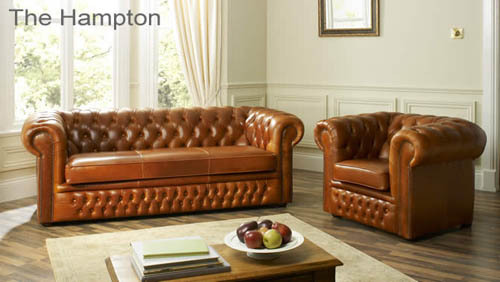 Based on our original Chesterfield Settee (The Clarendon). The Hampton has a single seat cushion stretching the full span of the seating area, this model is also available with indivisual seat cushions or a buttoned seat. A traditional leather Chesterfield sofa, offering top quality combined with a pleasant appearance and of course exceptional comfort. The Queen Ann Scroll Wing chair as pictured above is an excellent addition to the Baron Chesterfield sofa range. 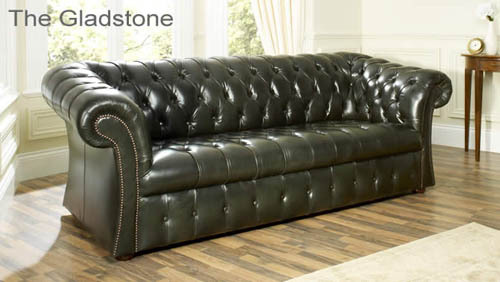 The Gladstone is a variation of the classic Chesterfield sofa. The top of the arm gently rises towards the back and the studding detail around the arm facing helps to draw attention to their eleqent shape. This model is available with individual seat cushions or a buttoned seat, single buttoned border, bronze studding and sits on chocolate finished bun feet. The Royal aniline leather sofa range features hand studding around the scroll arms, giving it a luxurious and traditional appearance. 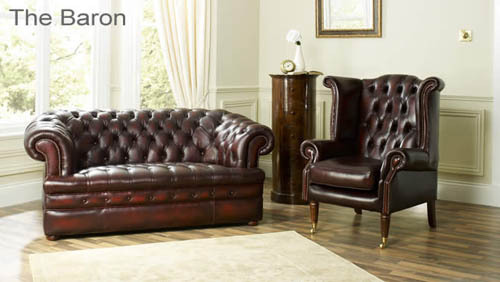 The Clarendon settee is a reproduction of the origional leather Chesterfield, with its design dating back hundreds of years. 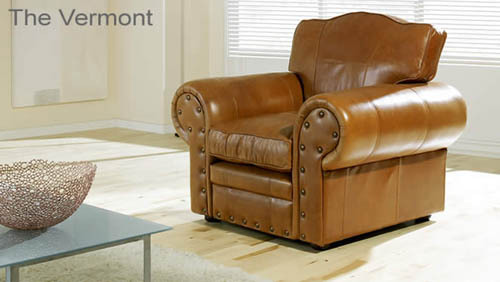 This vintage leather sofa combines exceptional comfort achieved by modern upholstery techniques, with the style and appearance that can only be achieved by traditional methods. 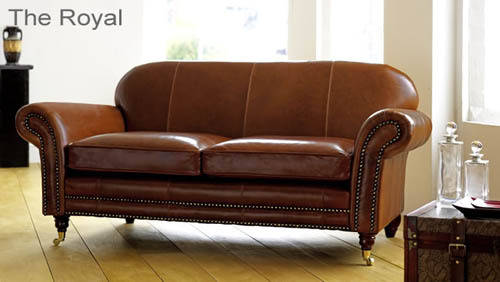 With it's unique hand studding and available in either antique leather or the contemporary natural brown leathers, the Vermont is a true traditional sofa with plenty of character. The Carmen leather sofa is predominantly a contemporary sofa but with classical touches such as the scroll arm design and classic hand studding. A superb design. 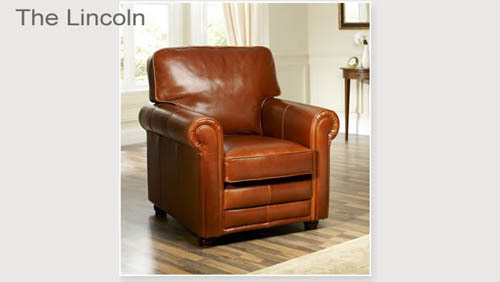 The Lincoln is available in a wide range of superb natural aniline leathers. Guaranteed to draw compliments from all who see it and be loved by all that use it. 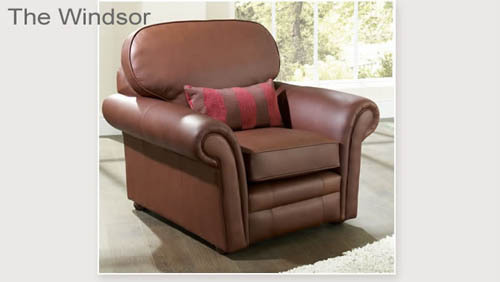 Similar in design to our Royal, however the Windsor is designed with soft back cushions offering head support and creating the ultimate relaxing leather sofa. Shaped arms add character to the design. 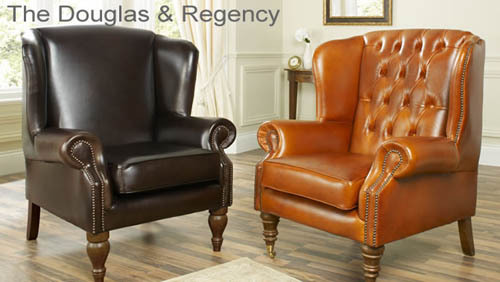 Why not compliment your aniline leather sofa with one of these beautiful wing chairs. 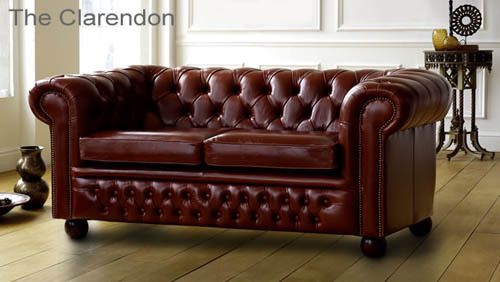 They can be uphostered in the same leather as all of our aniline leather sofas.